It is the second post of Yaroslavl Front Doors. In the previous time I told you about the front door on Kalmykovykh street, 5. Today the narration will about a front door on the same street. So, object #2, address Kalmykovykh street, (ул. Калмыковых), 3. The third building is the first of the set of working barracks. Initially, there were three-storey buildings but after there were four-storey. In spite of the front doors of different buildings are similar (they were made by the one author), the third building is different from fifth. It is tidier and even there is intact windows! — Our home is three hundreds years old, %#! — But there is no resettlement in that house across the street. Probably, the residents of the fifth building are living "as at the last time" before the final resettlement and the residents of the third house are more careful with their own flats. The door is unaltered for all buildings. There are no a combination lock and intercom: it is clear. There is a similar version (like in fifth building). It is a beautiful hammering of the late of XIX century. There is a permanent and elegant handrail. We can see a load-bearing structure of the staircase which implements a decorative function. Such hammering staircase is also sexual! If you are standing in the very bottom near the entrance door and a girl with spike heels are walking down the stairs, the whole front door is filled with a sexual clatter for three minutes. Who will be now from the top? WHO? The whole staircase is sexual vibrating. And no matter that your hopes and aspirations will be completely crushed… Main thing is anticipation. Summary: the staircase is very loud and noisy, but it's not always harmful (for example, you live on the third floor than you can know about your visitors three minutes before). It is more quality than the landing of fifth building. Most of the window are untouched and we can imagine the author's concept — good illuminated front door. The floors are not so dirty that we can explore an embossing of tiles. Moreover, even the glazing of corridor doors remains intact. The fact that the door wasn't burnt and the windows remain intact, tell us about the high resilience of spirit and purity of thoughts of the inhabitants of this front door. This belief, however, has been broken when several empty bottles of vodka was seen on windowsill. But it is a nuance. At last, the third floor, attic hatch is not locked. According to all, the inhabitants of the building are not very fond of door locks and in general all things affecting the breadth of the spirit. Climb to the attic, and, indeed, there is that which is difficult to get in other similar buildings of Yaroslavl. There is a huge rafter which holds the roof of the working barracks. It is more than 120 years old. Thanks to LiveJournal user yanlev for this amazing material. Thursday, April 30, 2009 in Story. You can comment (already 8 responses). New Russian tram line 1 in Yaroslavl (tram stop nearby the circus). And also there is an older tram. Wednesday, April 29, 2009 in Photo. You can comment (already 2 responses). Yes! We give away Russian gifts. 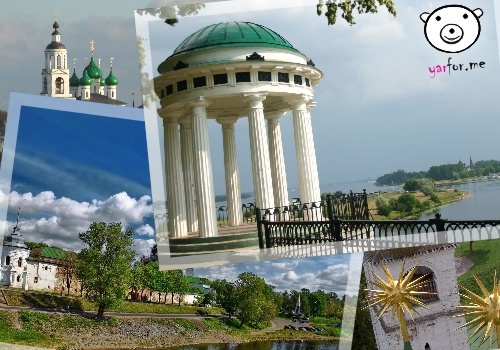 You can really get a free souvenir (beautiful postcard) from authors of Yaroslavl For Me website. That's all it takes! And as soon as you send us email, we will dispatch to you an amazing postcard from Russia. We would be grateful if you could tell your friends about this, or post on twitter, or on your blog. And we would be happy if you subscribe to our new posts. Tuesday, April 28, 2009 in News. You can comment (already 7 responses). Volkova square. 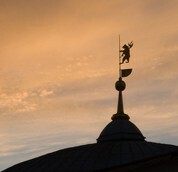 The sight on The Volkova theatre in Yaroslavl. Monday, April 27, 2009 in Photo. You can comment (we have one response). The idea to take up music born in student's hostel of Medical Academy in 1999 in Yaroslavl from Maxim Semenov. He was a student of Academy. Only in that place and only with special state of mind, the band with ridiculous name could be created. In 90s the band played so called "goat-punk". But in 2002 year Mamulki has decided to change both cast and style and they've recorded their first album "Ya tu-tu" (Я ту-ту! ), shot a music video and made appearances on local TV and radios. In 2003 the band worked with the hockey team "Lokomotiv". That's why sung couplets in hockey-style are sung in the whole Russia. In 2002 year we have learned to play music. And 2005 is the year of begging of corporate era of Mamulki's life. There was a mockery, live sound, funny arrangements and texts, bright caver-versions of soviet hits and the original scene image (crawlers, trousers with khokhloma-style and so on). All of this brought us to Moscow! There was about 10-20 performances each month in 2005-2006 years. They sang with the most poplar Russian and west stars (from Kirkorov to C.C.Catch) in fashionable clubs of Moscow and other city of Russia. After corporate music in 2007 Mamulki recorded the single "Veter" (Russian: Ветер, English: Wind) and shot a video in one of the Yaroslavl prison… and then they've recorded another two singles. In 2007-2008 mp3-collection (13 albums and 135 songs) and DVD (8 videos) were released. 2008 — tour and work in home studio in Yaroslavl. As result there is a new album "Noviy Albom" (Russian: Новый Альбом; English: New Album). 2009 year is beginning of work on the project of two bands Mamulki and Bakh-Kompot (Бах-Компот). Sunday, April 26, 2009 in Music. You can comment (already 4 responses). The project of Moskovsky prospekt (Московский проспект) reconstruction was approved. By 1000th anniversary there will be another bridge over Kotorosl which will be able to totally change transport streams in the city center. Kotorosl embankment will change as well. Yaroslavl drivers should have patience. The most heavy traffic street will be reconstructed. Yaroslavl government has decided to remove traffic jams and create a new interchange and bridge over the Kotorosl river. 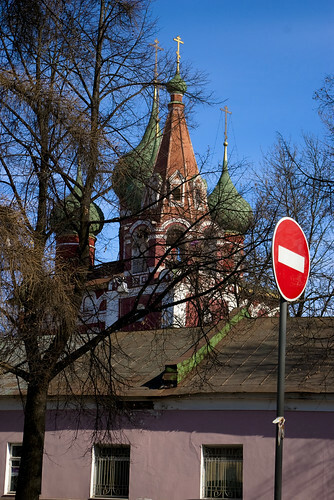 The center of Yaroslavl will be pedestrian. 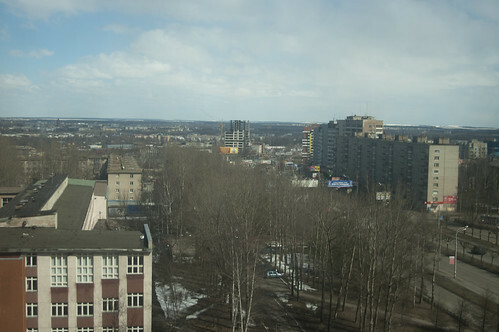 At the time, Bolshaya Fedorovskaya (Большая Федеровская) will be the main street of Yaroslavl. Sunday, April 26, 2009 in News. You can comment. Tuesday, April 21, 2009 in Photo. You can comment (already 2 responses). I'm glad to introduce our first podcast based on the materials of Yaroslavl For Me website. It's just a beginning and I think there are a lot of pitfalls in the record. I promise the next podcasts will be better! Transcript to whole first podcast is available on Google Docs where you can find both English and Russian texts (without translation). Скоро в Ярославле будет редкое астрономическое явление. Звездный фейерверк будет виден всеми жителями Ярославля. Метеорный поток идет от кометы Галлея. Безоблачное небо — это главное условие для видимости этого красивого явления. Есть большая вероятность, что до 22 апреля погода улучшиться. С этим и согласны синоптики, которые обещают уже на следующей неделе потепление до плюс 17 градусов. Download Yaroslavl For Me Podcast, Episode 1 or Subscribe to podcasts. Tuesday, April 21, 2009 in Podcast. You can comment (already 5 responses). There is a lot of good music bands in Yaroslavl which play classic and pop rock. One of them is Oskolki Neba (Russian: Осколки Неба; English: Sky Splinter). Lately the band celebrated six years! Unfortunately there is no much information concerning Oskolki Neba. Nevertheless I can present you their music compositions and some photos and posters. The band is actively developing and last half a year almost each month presents a new recorded song. In 2008 year the band won the music competitions "Rock Autumn" (Rok Osen) in nomination "Positive Emotions". Today Oskolki Neba takes part in different performances and events. Tuesday, April 21, 2009 in Music. You can comment. March 10 (February 25), 1909 the government of Russian Empire decided to create a great bridge over Volga near Yaroslavl city. Before the main line of North Railways between Moscow and Arkhangelsk has had a gap in Yaroslavl. 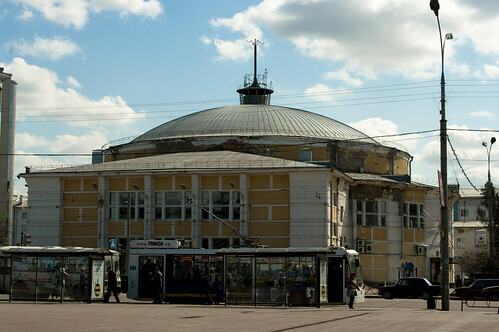 The building was entrusted to the engineer S. Olshevsky and all works cost approximately 5 million rubles. And in July 25, 1911 the assembly of the first bridge span was started. The width of this building was 376 sazhen and the weight was 376000 poods. It was the construction of society Putilovskih plants. The contractors were the brothers Stanislav and Ignaty Ron. The construction ended in 1913. Yaroslavl bridge got the official name "The bridge of Emperor Nikolas II". There are photos and some extra information on Yarcenter. Monday, April 20, 2009 in History. You can comment. The Students of Yaroslavl Theater Institute (teatralka) are preparing for the youth festival "The future of theatrical Russia" which opens on 20th of April in Volkov Theater. More than 500 students from 23 universities will take part in the festival. Yaroslavl are going to show three plays. Yaroslavl's students are waiting for communication with their fellows from the Moscow Arts Theater School studio and other universities. There will be 12 master class. Monday, April 20, 2009 in News. You can comment. Almost in each post I introduce a new section of our website. The same in this post. It's so because we're just opening our project and now we are filling it with interesting materials. Today I write about Yaroslavl details which can be seen on Yaroslavl buildings, streets, parks and so on. What: the tin sign with the inscription "Russian Insurance Company 1827 year" ("Российское Страховое Общество 1827 года") and plate with the address of building — 2. The comment: In the second half of 19 century there was a real boom of insurance in Russia. Mainly real estate was insured. On each insured building there was some sign which was like an advertisement as well. 1827 year is year of the foundation of the first Russian Insurance Company. Exactly this Company ensured this house on Vsekhsvyatskaya street, 2 (улица Всехсвятская), in present Maksimova street, 6. The comment: the same sign which indicated that this house was insured by the North Society. The sign could remain because there is the museum of Leonid Sobinov in this building. The comments: Such signs could remain in good peasant houses. Thanks a lot to Masquerade and to his post. Sunday, April 19, 2009 in Story. You can comment. I am glad to open our new set of stories of our website. Recently I found out about quite interesting Russian LiveJournal in which a author writes about front doors (street door, or in Russian парадная, paradnaya, or in contemporary Russian подъезд, pod'ezd). The author pays attention to details. He walks in different places of Yaroslavl and takes photographs inside old houses and buildings. Let's start with the first Yaroslavl's front door. 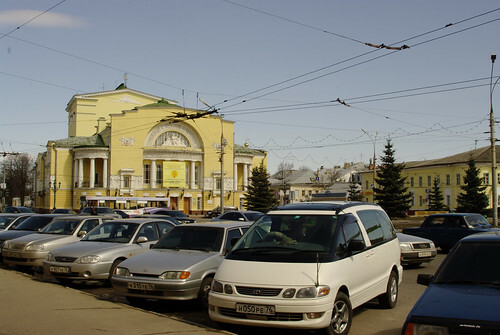 The object #1, address: Kalmykovykh street (ул. Калмыковых), 5. Working barracks, well-known by residents as "korpusa", were built in 1880-1890 years as dwellings for employees of Yaroslavl's Big Manufacture. There are eight red-brick buildings (three-storey and four-storey) and one white building. In present only four red and white are inhabited. Buildings in Perekop are whole stratum of Yaroslavl's history. Starting as working barracks, then they have evolved into the most known communal flats, source of crime and permanent headache for government and residents. They are a cause of Perekop's bad reputation. This is understandable. Approximately 4000 people have lived in these nine buildings before the revolution. Three-storey building could accommodate three hundreds and four-storey — four hundreds. The number of inhabitants have been increased in 3-4 times after "compression" of Soviet Government. Thus there were at least twenty thousands people on such small territory. No professors, no chief engineers, no academician. There was a reconstruction and resettlement in 1960th. The main part of inhabitants have departed for Bragino, but remaining people dished it out to whole Yaroslavl. Today the resettlement is practically over. There is no bygone atmosphere, but there is rests of the material culture. Well, go to the front door of building number 5 on Kalmykovykh street. Staircase is the main decoration of a front door, and it is difficult to find such staircase in our city. It was made of cast iron! It is the eternal material, so stairs are not destroyed and they kept the original image in spite of dreadful quarrels (there were lots of dead persons in Soviet period). Pay attention to the legs of the handrails! But initially they were made for houses of unskilled workers! Apertures between stages are really great. The height is around six meters! There are famous passages on both sides of the staircase. The passage divides all buildings: sixteen rooms on one sides and sixteens on another. Such room was called kamora (the chamber) and it was a space 4m×8m (32m). One room was for one family of a worker. In 1960th after reconstruction the rooms have been turned into an individual apartment with all conveniences inside rather than outside. In post cases these apertures was closed with bricks and fastened with nails. The buildings were built with the latest technologies of the time — using the fixture (the armature). Yes, it's a very funny verse… with informal words. Monday, April 13, 2009 in Story. You can comment (already 2 responses). Saturday, April 11, 2009 in Photo. You can comment. Recently we started to write about Yaroslavl music bands. Today I would like to tell you about one of my favorite group. It is Vnuki Svyatoslava (Russian: Внуки Святослава, English: Svyatoslav's grandchildren) which plays an acoustic folk-rock. Let's start form beginning. February, 2002. Dmitry Konov and Artem Chirkov were studying in Yaroslavl State Technical University as two-year students and there was examinations, when Artem returned home in Tutaev after the last exam. There were nobody at his home and there would be plenty of couple of weeks of a holiday. What to do? Yes, Artem has decided to record a disk with his song. The more so because he bought a guitar half a year ago. When he has come from the holiday to carry on his education he proposed to listen to his work to a few friends. Especially he wanted to know Dmitry's opinion, because Dmitry was a musician and played as bass in the band "Osoboe Mnenie". Dmitry said that he liked couple of Artem's songs. Artem inquired Dmitry to arrange his songs and Dmirty agreed and went to Tutaev for three days. By the evening they have recorded several songs and decided to create a new rock-band. It was the born of Vnuki Svyatoslava. In March, 2005 Dmitry Konov met with a fascinating girl. She is Oksana Knyazeva. She has been engaged academic voice for 8 years and at present she studies in Yaroslavl Music Specialized School after L.B. Sobinov. And it was a beginning of the present life of band. Once Dmitry invited Oksana to rehearsal and asked her to sing the song "Iskat Sebya". It was unbelievable! There are two albums of Vnuki Svyatoslava: Iskat Sebya and Plesti venkami pesni. Saturday, April 11, 2009 in Music. You can comment (already 4 responses).